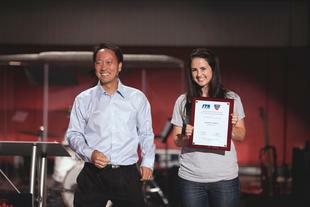 Professional tennis player and Biola University board member Michael Chang delivered an encouraging message to the student body on Friday, Sept. 16 at a special chapel recognizing Biola’s athletic programs. Chang set several records during his athletic career for being the youngest player to achieve success at a very high level of competition. On the tennis court, Chang is known for his passion and this fervor carries over into his spiritual life. At the age of 15, he became the youngest player to win a main draw match at the U.S. Open and reach a tour semifinalist status. Two years later in 1989, Chang clinched the French Open Grand Slam Championship and placed in the quarterfinals and above in 13 singles tournaments. Chang spoke to Biola from his experiences as a professional athlete and former student of Biola's Talbot School of Theology, encouraging varsity athletes and students in any arena of performance to pursue excellence for the glory of Christ. He urged students to avoid settling for mediocrity, but instead to use the talents and determination God has given them to compete to the best of their ability and treat their opponents with love and respect. Chang also recognized junior and tennis player Danielle Calbeck who recently was awarded the 2011 Women’s Arthur Ashe, Jr. Leadership & Sportsmanship Award from the Intercollegiate Tennis Association. The chapel service concluded with an acknowledgment of all varsity athletes and everyone present was invited to pray for their season’s success and blessing.